Today, I would like to invite you to the upcoming Women’s Bible Study Expo that will be held on Thursday, July 18th from noon – 3 pm (CST). It is a wonderful opportunity to hear from nine incredible authors of women’s Bible studies. This is a great way to get some information before selecting your upcoming study for the fall as well as a chance to win a copy of these studies. Be sure to go to the Women’s Bible Study Expo site and register today. I have the privilege of giving you a sneak peek of one of the authors, Suzanne Eller, on my blog today. She graciously agreed to answer my interview questions about her latest book, The Unburdened Heart, to share with my blog readers. What inspired you to write The Unburdened Heart? There are a lot of really powerful books on forgiveness, but the theme seems to be “do it because scripture says so”. That’s reason enough, but I wondered why. Because “just do it” can leave you with a greater burden when you try, and it just isn’t working. I began to study this word. Every instance in scripture. In context. To determine what scripture was really telling us. And the answers rocked my world. Because that word was a very diverse word. For example, in one instance, it means to “leave one place to find another”. To leave bitterness to find wholeness. To leave anger to find peace. To leave the debt collection business to find mercy. Understanding why, and what it looks like, and how to do it, and what it’s not frees a believer to truly live life as a forgiver. And I discovered the answer to one more of my questions. Forgiving matters to God because we matter to God, and unforgiveness is a weight that keeps us stuck. We were never intended to live stuck, not as a believer. Summarize your book in a few sentences to someone looking for a book for her next Bible study. The word “forgive” is not, as many people think, one-dimensional. 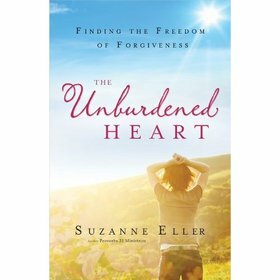 In The Unburdened Heart, Suzanne Eller explores with readers the multiple facets of forgiveness found in the Scriptures. Women can leave pain to find wholeness, leave regret to find purpose and leave the past to live fully in the present. The Unburdened Heart uses the power of story along with biblical teaching to lead readers into healing and a forgiving lifestyle. Why do you think that this book will appeal to readers in today’s society? Just this past week I spoke at a conference and taught on Hebrews 12:1-2. When we talked about the weights that slow us down, and I described the weight of unforgiveness, person after person came up after to share their story, and how hurt from the past or present had caused them such heartache or anger. These were Christians who wanted all that God had for them, but this was a weight that seemed too big to ever “throw off”. I LOVE seeing the joy in a person’s eyes when they grasp what it means to forgive, and surrender to the process. You state that The Unburdened Heart is an “invitation to discover the freedom of forgiveness”. What does that look like? How would you respond when someone says, yes, but you do not know what I have been through. I could not possibly obtain freedom? I just mentioned it. It’s our first step. Surrendering to forgiveness is such a powerful step because it means we are no longer fighting the battle alone. God, I don’t know what this is going to look like. I don’t know where you are taking me. I don’t know what you will require, but what I do know is that I can’t do it on my own. I need you and I surrender to your love for me, and this invitation to live free. What were your goals while writing The Unburdened Heart? Not just to write from my experience, but to invite others to share their stories. Of overcoming. Of joy. Of pain. Of struggle. And to stay true to scripture, digging so much deeper than “just forgive”. I wanted the reader to walk away understanding it on such a powerful, intimate level that they rejoiced at the invitation to forgive, even knowing that it would take them in the deeper parts of their faith. That we are intended to live free, and scripture shows us how. **I would highly recommend you get a copy of this book for yourself or even get a group of ladies together and go through the study. This is one book that will have such an impact on your life. Pick up a copy today and start on a journey to live life the way we were intended to live – free.